Picture Myanmar gives you a chance to take photos of sunrises over pagodas, colonial architecture and street markets. Visit mountains and learn to use natural lighting to shoot outdoor landscapes. Photograph cottage industries and local artisans. Begin in Yangon ad continue onward tosee the unique Golden Rock Take pictures from a hot air balloon over Bagan and from a riverboat. Create your own visual memories of this tour. 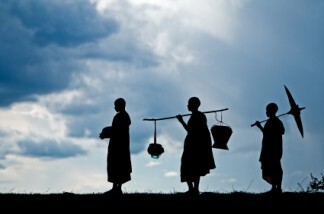 Picture Myanmar is a travel book of your photos. Arrive in Yangon where you will be met and driven to your hotel. Enjoy a Welcome/Orientation dinner. Photograph an exotic morning sunrise over the magnificent Shwedagon pagoda, where many local Buddhists come to worship each morning. After breakfast explore Yangon. Walk along Pansodan street which has many large colonial buildings still in use. Photograph colonial architecture. It is also interesting to see the sidewalk markets including those selling old books and magazines dating from the 1960’s up to the present. Photograph the bustling markets. Early morning sunrise over the pagoda. This is a chance to use your skills photographing sunrise over this pagoda. Drive back to Yangon and visit the excavated site of the famous King Bayinnaung who reigned over the Toungoo Dynasty for 30 years. Visit a handicraft cottage and Bago, a monastery. End the day with a tour to a local pottery village to photograp traditional Myanmar pottery being made. This morning, enjoy sunrise over Bagan in a hot air balloons. Photograph from the air. After breakfast, visit to Minnanthu village and visit 13th A.D style pagodas and photograph daily activities of local people at Pwa-saw village. Try your temple photograph skills on a tour of the Payathonezu temple with its colorful religious paintings & Thanbula pagoda. Visit Lawkananda pagoda and Ashae-Pet-leik and Anauk-Pet-leik pagadas. In the afternoon, visit Sulamani temple, Dhamayangyi temple then onward to lacquer ware workshops and the famous Lacquer ware artisans of Myanmar to photograph the crafts people at work and learn from them their techniques. Enjoy your breathtaking sunset by horse cart ride. Transfer to the airport for your flight to Mandalay. You will be met and transferred to your hotel. Mandalay was briefly the Burmese capital in the second half on the 19th century. It remains the economic, cultural and religious heart of upper Myanmar. Drive to Amarapura and begin photographing the Mandalay area. Here we will visit Mahagandayon monastery, which is a school for young monks, and the nearby U Bein Bridge. It is more than two centuries old and at 1.2 km is the longest teakwood span in the world. We will visit another former royal capital, Inwa which was founded in 1364 and which lasted nearly 400 years as a royal capital. Highlights include the ‘ leaning tower of Ava’, Maha Aungmye Bonzan, a brick-and-stucco monastery, and the elegant teakwood monastery Bagaya Kyaung. Continue to Sagaing, a former capital of the Shan kingdom in the 14th century, which lies across and slightly downriver from Mandalay. Photograph the many interesting stupas scattered over Sagaing Hill. This morning drive to Kywezon jetty to photograqph the busy riverside activity and take a local riverboat to the ancient capital of Mingun (app. 1 hour per way). Mingun is home to the world’s largest ringing bell, which weighs over 87 tons. Pay a visit to the site of the bell and continue to the unfinished Mingun Mantara pagoda, which was built between in the late 18th century by King Bodawpaya. A massive earthquake some years later caused the upper portion of the pagoda to collapse. Photograph the views from the top of the pagoda which are remarkable, especially in the late afternoon when the setting sun casts an enigmatic light over the region. Visit the Settawya pagoda, walk to the huge Mingun Bell (90 tons), and the Hsinbyume pagoda nearby. Then back to Mandalay, for visits and more photography tips of cottage crafts as the gold leaf making industry, tapestry, wood carving, bronze making, and marble stone carving. Visit the Golden Palace Monastery, located close to Mandalay Hill, it is known locally as Shwenandaw and was built in the early 19th century, being famous for its teak carvings of Buddhist myths. Also at the foot of Mandalay Hill lies Kuthodaw pagoda, which was built in 1857 and is home to the world’s largest book. Visit the Maha Muni pagoda later in the day, which is regarded to as the holiest site in Mandalay and is not to be missed. Drive up to Mandalay Hill, which is home to many religious sites, and photograph the magnificent sunset views from the 230m high summit.